China’s President Xi in the Middle East: From U.S. 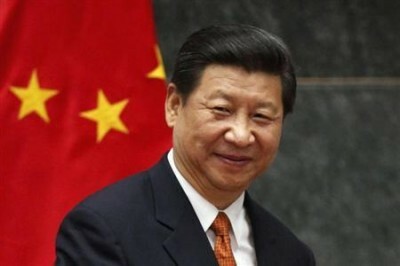 Regime Change to Chinese Economic Development? President Xi Jinping’s three-nation tour in the Middle East heralds a shift from US regime change to Chinese economic development. President Xi’s tour took place amid a perilous moment in the region. Saudi Arabia is struggling with the plunge of oil prices, rapidly rising debt and a war against Yemen. In Egypt, opposition is increasing against the perceived successors of President Hosni Mubarak’s three-decade long rule. In Iran, sanctions have been lifted after decades of international insulation. In one way or another, all three countries are also involved in Syria’s civil war, battles against the Islamic State and regional conflicts, along with Russia, the U.S. and European powers; the continuing Israel-Palestine conflict; and the economic and religious Sunni-Shi’a friction which contributes to regional rivalries, splits several Arab states internally and has been historically manipulated by foreign powers. Xi’s tour signals a shift away from the “divide and rule” colonial legacies to economic development. In his first stop in Riyadh, Saudi Arabia, President Xi met Saudi King Salman bin Abdulaziz Al Saud and Deputy Crown Prince Mohammad bin Salman. It was the climax of longstanding rapprochement. Saudi Arabia established diplomatic relations with China only after the Cold War in 1990. By the early 2010s, China supplanted the US as Saudi Arabia’s largest crude oil client. At the same time, bilateral trade has soared to $74 billion. China is Saudi Arabia’s largest trade partner. During Xi’s visit, Saudi Aramco and China’s Sinopec signed a $1.5 billion agreement for strategic cooperation. China also plays a role among Saudi Arabia’s military suppliers. In Egypt, President Xi met President Abdel Fattah al-Sisi, amid Cairo’s controversial measures to suppress the 4-year anniversary of the 2011 uprising. Egypt was the first country in Africa and the Arab world to establish diplomatic relationship with China in 1956. Nevertheless, bilateral strategic cooperation was initiated only in 1999 and a comprehensive strategic relationship two years ago. In 2014, total bilateral trade amounted to $12 billion. That’s when Beijing established a $100 billion economic and trade cooperation zone in Egypt. China is discussing potential investments in large Egyptian infrastructure projects. Beijing is also expected to lend Egypt’s central bank $1 billion to assist its efforts to shore up foreign reserves. President Xi’s last stop was Tehran, where he met his Iranian counterpart Hassan Rouhani and the supreme leader Ayatollah Ali Khamenei. Since 2011, China has been Iran’s leading customer for oil exports, even as the West ramped up sanctions against Tehran. Iran, said President Rouhani, would not forget “friends who helped us” in a difficult time. In 2014, bilateral trade amounted to $52 billion. China is Iran’s largest trade partner. In Tehran, the two countries opened a “new chapter” in bilateral ties by agreeing to expand trade to $600 billion in the next decade. To Beijing, Iran is a critical hub along the new Silk Road route. To Tehran, China means great economic opportunities in the post-sanctions era. In brief, President Xi’s three-nation tour codified China’s presence in the Middle East as a major energy buyer, major importer, infrastructure builder, and peace broker. If China’s effective presence in the Middle East began to increase in the early 21st century, the U.S. role originates from the postwar era. After the 1945 Yalta Conference, which effectively divided Europe, President Roosevelt’s subsequent meeting with Saudi King Abdel Aziz Ibn Saud led to a secret agreement, which required Washington to provide Riyadh military security in exchange for secure access to supplies of oil. For more than six decades, that pact prevailed, despite Washington’s periodic debates about US need for energy self-sufficiency. But in the past decade, it has begun to crumble with the U.S. shale gas revolution. Moreover, the spread of terror and counter-insurgencies pose questions about the viability of interventionist policies in the Middle East. The US approach has been predicated on strategic alliances and – whenever such alignments have not been viable – on regime change. In March 1949, the CIA sponsored the coup d’etat by Col. Husni al-Za’im, which overthrew democratic rule in Syria. In 1953, the CIA helped Shah Mohammad Reza Pahlavi to remove the democratically elected Prime Minister Mohammed Mossadegh, which destabilized Iran’s inclusive development for decades, paving the way to the 1979 the Islamic revolution. During the 1958 Lebanon crisis, President Eisenhower first applied the doctrine under which the U.S. would intervene to protect regimes it saw threatened by international communism. In the Kennedy era, CIA planned a coup against Abd al-Karim Qasim’s Iraq. With the 1970s energy crises, the proclivity for intervention intensified. During the Yom Kippur War, President Nixon authorized a strategic airlift to deliver weapons to Israel, which led to decades of massive military aid to Israel, despite continued settlement violations in the occupied territories. Meanwhile, the CIA armed Kurdish rebels fighting Iraq’s Ba’athist leadership. Under Reagan, Washington sent troops to Lebanon during the Lebanese Civil War until the Beirut barracks bombing. During the 1980s Iran-Iraq War, U.S. warships escorted Kuwaiti oil tankers against Iranian attacks, while attacking Iran to pressure Tehran to a ceasefire with Iraq. In 1986, Libya was bombed in response to terrorism. After the Cold War, the U.S. led a coalition to remove Iraq from Kuwait in the Gulf War. In 2003, U.S. invasion of Iraq toppled the government of Saddam Hussein, unleashing a decade of instability and giving rise to the brutal Islamic State. In 2011 the U.S. participated in a Western coalition that launched a military intervention in Libya and covert operations elsewhere in the Middle East. And when Syria was swept by a civil war, the U.S. joined in, along with France and the U.K. The list of U.S. interventions in the region is long and bitter. The historical roots of regime change originate from the 19th century imperialism and 20th century colonialism. In the Bush era, regime change was an explicit neoconservative objective; in the Obama era, it has been implicit in assertive liberal internationalism. As a result, America is not seen as an honest broker in the region. In contrast, the Chinese approach builds on non-interference, stabilization and economic development. Historically, China and the Arab world share a history of imperial disintegration, colonial humiliation and struggle for sovereignty and territorial integrity. Although the relations between China and the Arab world go back to the 1955 Bandung conference of the Non-Aligned Movement, economic cooperation began to intensify with the opening of the Sino-Arab Cooperation Forum in 2004. In the past decade, this cooperation has broadened on the back of economic cooperation. With the “One Road, One Belt” initiative, it has potential to contribute dramatically to economic development. But while it differs diametrically from U.S. policies, it is not positioned against U.S. interests in the region. Indeed, some U.S. administration officials see the Chinese presence in the region as a real opportunity to de­escalate growing Saudi-Iranian friction. What we are witnessing in the Middle East today and what President Xi’s tour signals is not just bilateral trade expansion, but a new secular tend that heralds the rise of multi-polarity in the region.